"Parents, if you love your children, do all that lies in your power to train them up to a habit of prayer. Show them how to begin. Tell them what to say. Encourage them to persevere. Remind them if they become careless and slack about it. Let it not be your fault, at any rate, if they never call on the name of the Lord. This, remember, is the first step in religion which a child is able to take. Long before he can read, you can teach him to kneel by his mother's side, and repeat the simple words of prayer and praise which she puts in his mouth. And as the first steps in any undertaking are always the most important, so is the manner in which your children's prayers are prayed, a point which deserves your closest attention. Few seem to know how much depends on this. You must beware lest they get into a way of saying them in a hasty, careless, and irreverent manner. You must beware of giving up the oversight of this matter to servants and nurses, or of trusting too much to your children doing it when left to themselves. I cannot praise that mother who never looks after this most important part of her child's daily life herself. Surely if there be any habit which your own hand and eye should help in forming, it is the habit of prayer. Believe me, if you never hear your children pray yourself, you are much to blame. Prayer is, of all habits, the one which we recollect the longest. Many a grey-headed man could tell you how his mother used to make him pray in the days of his childhood. Other things have passed away from his mind perhaps. The church where he was taken to worship, the minister whom he heard preach, the companions who used to play with him, all these, it may be, have passed from his memory, and left no mark behind. But you will often find it is far different with his first prayers. He will often be able to tell you where he knelt, and what he was taught to say, and even how his mother looked all the while. It will come up as fresh before his mind's eye as if it was but yesterday. Reader, if you love your children, I charge you, do not let the seed-time of a prayerful habit pass away unimproved. 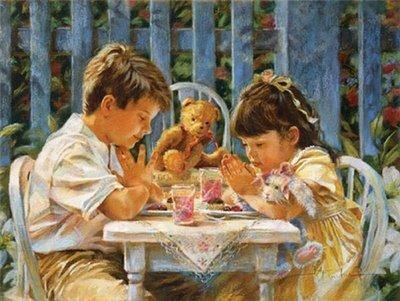 If you train your children to anything, train them, at least, to a habit of prayer." The childhood praying is so true. My mother embedded bedtime prayer in me so much that it is rare that I fall asleep w/out it! While it was a habit my husband had to work hard at.